Ambalavao, Madagascar - Babies wail as a nurse tries to reassure mothers who have come to vaccinate their children against a measles outbreak that has killed more than 1,200 people in this island nation where many are desperately poor. Measles cases are rising in the United States and elsewhere, in part because of misinformation that makes some parents balk at receiving a vaccine. New York City is trying to halt an outbreak by ordering mandatory vaccinations in one Brooklyn neighborhood. In Madagascar, many parents want to protect their children but face immense challenges, including the lack of resources. On a recent day, the Iarintsena health center’s waiting room was full, with mothers sitting on the floor and others waiting outside in the overwhelming heat. Two volunteer nurses and a midwife tried to meet the demand. “I’m so scared for him because in the village everyone says it kills babies,” Razaijafisoa said. The outbreak has killed mostly children under 15 since it began in September, according to the World Health Organization. “The epidemic unfortunately continues to expand in size,” though at a slower pace than a month ago, said Dr. Dossou Vincent Sodjinou, a WHO epidemiologist in Madagascar. By mid-March, 117,075 cases had been reported by the health ministry, affecting all regions of the country. This outbreak is complicated by the fact that nearly 50% of children in Madagascar are malnourished. “Malnutrition is the bed of measles, ” Sodjinou said. Razaijafisoa’s baby weighs just 5 kilograms (11 pounds). “This is the case for almost all children with measles who have come here,” said Lantonirina Rasolofoniaina, a volunteer at the health center. Simply reaching a clinic for help can be a challenge. Many people in Madagascar cannot afford to see a doctor or buy medicine, and health centers often are understaffed or have poorly qualified workers. As a result, information about health issues can be unreliable. Some parents are not aware that vaccines are free, at least in public health centers. Four of Erika Hantriniaina’s five children have had measles. She had wrongly believed that people could not be vaccinated after nine months of age. The girl had diarrhea and vomiting and couldn’t eat, Hantriniaina said, adding that she narrowly survived. Measles, a highly infectious disease spread by coughing, sneezing, close contact or infected surfaces, has no specific treatment. The symptoms are treated instead. “Vitamin A is given to children to increase their immunity. We try to reduce the fever. If there is a cough, we give antibiotics,” said Dr. Boniface Maronko, sent by WHO to Madagascar to supervise efforts to contain the outbreak. If the disease is not treated early enough, complications appear including diarrhea, bronchitis, pneumonia and convulsions. 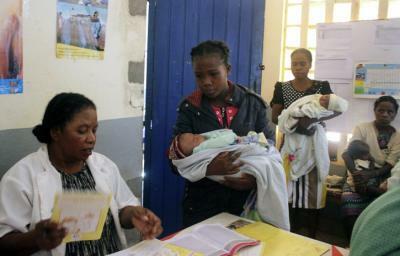 Madagascar’s health ministry has sent free medication to regions most affected by the outbreak. Maronko reminded heads of health centers in the Ambalavao region not to make parents pay, saying he had seen some doctors asking for money. He told The Associated Press that he feared the medicines wouldn’t be enough. The country’s capital, Antananarivo, a city of 1.3 million, has not been spared. For a few days she did not worry: “I felt like he was healed.” But one morning she noticed he had trouble breathing. Later she found his feet were cold. “Look at my baby,” she told her mother. Ravonjisoa said she blames herself, “but I did not imagine for one moment that he was going to die.” At the hospital, a doctor confirmed that her baby died of measles-related respiratory complications. Late last month, WHO started a third mass vaccination campaign in Madagascar with the overall goal of reaching 7.2 million children aged 6 months to 9 years. “But immunization is not the only strategy for the response to this epidemic. We still need resources for care, monitoring and social mobilization,” said Sodjinou, the WHO epidemiologist.